The interference or electronic “noise” generated by alternators, ignition systems, motors, etc., can render a vehicle’s radio, data receivers or other electronic equipment virtually useless. This interference takes the form of popping or static on radios or audio gear and garbled images or “hash” on video displays. These specialized filters can be used singly or in combination to attenuate conducted line noise, either at the affected equipment or at the noise source. 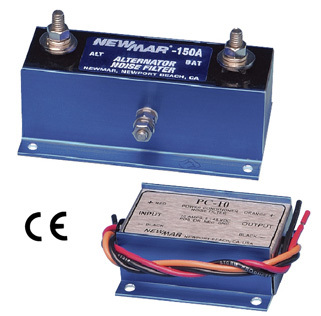 The “PC” models feature inductor and capacitor circuit that filters both the “+” and “–” leads. The “IF” model utilizes an inductor and filters the “+” lead only.